This season brings some of the most fantastic flavours of the year. It also gives us an opportunity to crank up the oven for more than 10 minutes without passing out from heat exhaustion. I was inspired by the beautiful colour of the yams at our Farmer’s Market. I knew I had to come up with something new and these gnocchi fit the bill perfectly. The aroma that filled my house when I was roasting the sweet potato and yams was enough confirmation that I was on to something special. After mashing them both together I could have eaten them with pure joy just the way they were. But I had gnocchi on my mind and good thing because man, they were one of the best things I’ve tasted in a while, I absolutely loved them. Thankfully this recipe makes a lot so I was able to freeze a batch to have on hand. Read the note below for instructions on freezing. You’ll want to have these at the ready for you. Trust me. 1. Preheat oven to 400 degrees. Prick the sweet potato and yam with a fork all over. Place them both on a baking sheet and roast for about an hour, flipping half way through. Bake until they are very tender. 2. Remove from oven and allow to cool. Once cooled, remove the skin from both. Place the pulp in a large mixing bowl and using a potato masher or fork, mash the pulp completely together. At this point season the pulp mixture with salt and pepper to taste and mix in the nutmeg and cinnamon. Add the eggs to the mixture followed by the flour. You may need more flour to make the dough come together. The consistency should be soft and sticky but not wet keeping in mind you will be adding more flour while you’re rolling out the dough. 3. Dust a large surface with flour, separate the dough into 4 pieces. Take one piece of the dough and roll it out on the floured surface into a long roll about 1" thick. Cut the dough into 1" pieces. Using the tines of a fork, gently press into the top of the pieces to make a slight indent. Place the gnocchi on a floured baking sheet and either place in the freezer for future use or set aside while your water comes to a boil. Repeat with the remaining 3 pieces of dough. 4. Bring a large pot of water to a boil. Place the gnocchi in the boiling water and stir immediately, keep stirring until the water returns to a boil. The gnocchi are done as soon as they float to the surface of the water. Make sure you don’t overcook, it should only take a few minutes. Remove the gnocchi and stir into the sauce (sauce recipe below). Serve with freshly grated parmesan cheese. 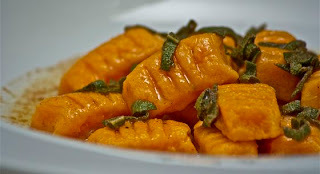 *Note: To freeze the gnocchi, place the individual gnocchi on a floured baking sheet and place in the freezer. Once the gnocchi are frozen place them in a freezer bag. To cook once frozen simply place the frozen gnocchi in boiling water and remove them once they float to the surface. 1. Melt butter in a saute pan. Cook over medium heat until the butter becomes golden brown. Add sage leaves and lemon juice remove from heat. Serve over pasta. Wow..this recipe sounds amazing and doesn't look to be too difficult. Can't wait to try it. I don't know if I can find yams. Could I just use sweet potatoes? What definition of yam and sweet potato are you using? The British Columbia version, where a yam is the orange fleshed one and the sweet potato is the pale yellow fleshed one? Or the rest of the worlds' definition where a sweet potato has orange flesh, another derivation of sweet potato has pale yellow flesh, and a yam is an entirely different root vegetable altogether and rarely sold in North America? ?